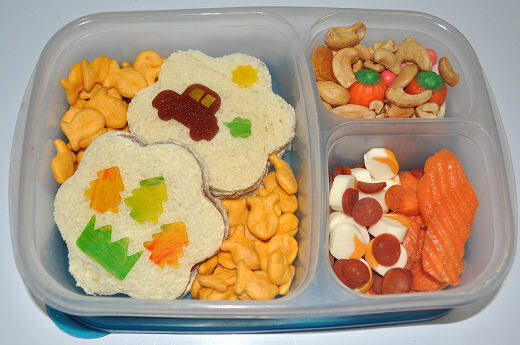 Aaron has an egg salad sandwich with fruit strips as decoration, Baby Bel cheese, Mandarin oranges, mini turkey pepperoni, Goldfish crackers, cashews, and a cupcake. 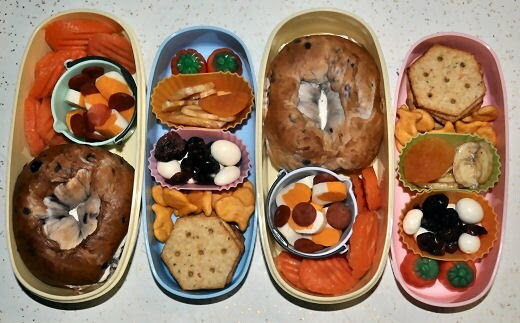 The girls each have half of an egg salad sandwich with fruit strip decorations, Goldfish crackers, Baby Bel cheese, Mandarin oranges, a mini cupcake, vanilla yogurt covered raisins, and Wheat Thin Stix. Aaron has a whole wheat bagel with honey nut cream cheese, cashews, candy pumpkins, peppered turkey, two hard boiled eggs, string cheese, two mini cupcakes, dried apricots and Yogos. The girls have a whole wheat bagel with honey nut cream cheese, half of a hard boiled egg, string cheese, candy pumpkins, Wheat Thin Stix, fruitt snacks, dried apricots, cashews, and raisins. I cross posted this to my main blog for the whole linky meme thing since this blog has like no readers and is mostly for my own reference. 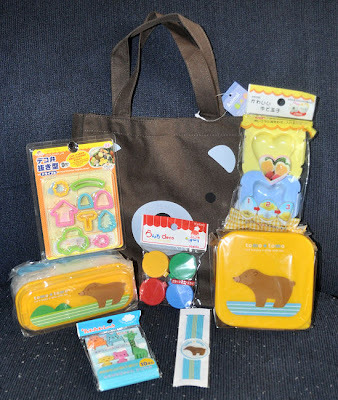 Yet another update to the Bento Giveaway! The response to my Bento Lunch Giveaway has been overwhelming! I love you guys! I've added a couple more items to the loot- go check it out! I've also added another way to enter to win, so you have even more chances! Egg salad in a whole wheat mini pita, Baby Bel cheese, carrots, and ranch in the dip container. In the side car, a cream filled cake, vanilla yogurt covered raisins, raisins, and banana chips. Car shaped hard boiled egg, mini turkey pepperoni, carrots. Two mini whole wheat pitas stuffed with egg salad, Baby Bel, ranch in the dip container. Yogos, candy pumpkins, and Fritos. 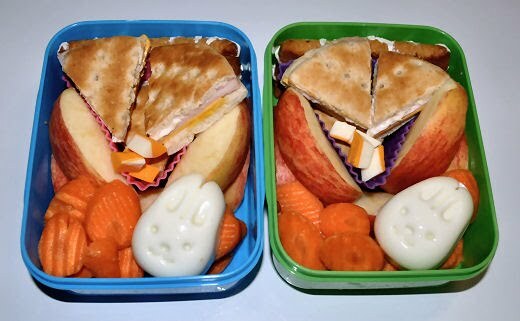 For lunch tomorrow, Aaron has a sliced apple, turkey and muenster on a sandwich thin, mini turkey pepperoni, a cheese stick, carrots and a hard boiled egg shaped like a fish. The sandwich is supposed to be a butterfly, but it's pretty pathetic! The girls have a granola bar, half of a bologna & cheese on a sandwich thin, a few pieces of Aaron's string cheese, half an apple sliced up, carrots, and half of a bunny shaped hard boiled egg. Aaron's lunch has two PB&J flowers decorated with fruit strips that I cut out... it's supposed to be a car driving in the sun with the little exhaust smoke out the back and a forest. He also has goldfish, cashews, YoGos, candy pumpkins, banana chips, and dried apricot in the smallest section and cheese stick slices, mini turkey pepperoni and carrots in the last section. The girls have PB&J decorated with fruit strip cutouts, goldfish, sliced cheese stick, a pumpkin candy, cashews, mixed dried fruit, banana chips and yogurt covered raisins. Under the sandwiches is a granola bar to hold the one side up on an angle. I can't believe this weekend is over already! It went buy really fast! YoGos, candy pumpkins, dried apricots, banana chips. Blueberry bagel with honey nut cream cheese, goldfish, veggie wheat crackers, mini turkey pepperoni and a cheese stick. I also sent him with strawberry yogurt and a Reese's Peanutbutter Cup. Blueberry bagel with honey nut cream cheese, carrots, mini turkey pepperoni, cheese stick, veggie wheat crackers, gold fish, vanilla yogurt covered raisins, dried berries, dried apricot, banana chips, candy pumpkins. Also, but not shown, a frozen Go-Gurt. 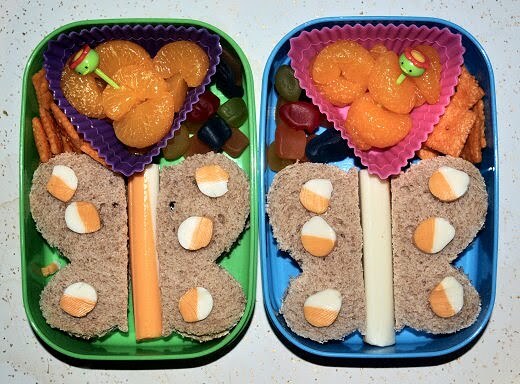 I was inspired by the butterfly bento picture I'd used in the last post so today the girls have butterfly PB&Js with a cheese stick body and slices of the cheese stick as wing decorations. They also have a silicon muffin tin full of mandarin oranges and cheese crackers and fruit snacks on the sides. I've had several people ask me about the lunches I make for the girls and Aaron. I'm going to try to answer them, hopefully I'll remember what I was asked! If I missed something, feel free to ask again! Where do you get the containers and accessories? I really have a ton of containers- I most frequently use my Easy LunchBoxes (where I'm an affiliate) set for Aaron, and I have two more sets on the way for the girls. I can't wait to get them, they are fabulous! I wrote a review of the system right here. 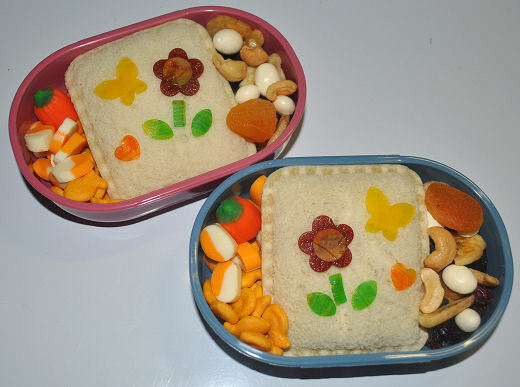 I also use traditional two tier Japanese bento boxes often for the girls. I've purchased them from a few places, such as All Things For Sale (use code tatertwins for 5% off), Bento Crazy, and another online retailer who recently closed their doors to internet sales, boo. These places also carry the majority of the accessories I use, including food picks, belts (elastic to hold the tiers together), egg molds, food cutters, and bags. I use the silicone muffin tins in various shapes to keep food separate, instead of the disposable paper ones. I bought those at Michael's, where you can also find the food-safe markers I occasionally use. 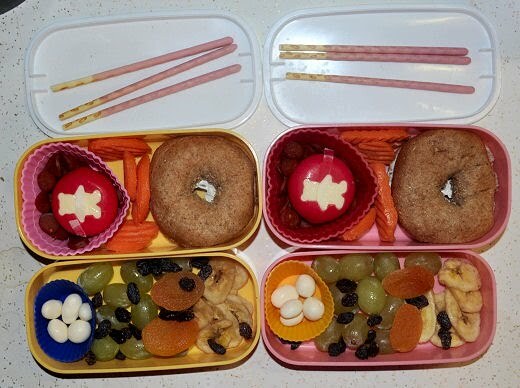 How long does it take to pack their lunches like this? I really think it takes only a few minutes longer than throwing a sandwich and some chips in Ziplock baggies. I try to stock up on bento-friendly foods, which helps. By keeping small things like raisins, cheese sticks, cherry tomatoes, canned fruit, etc in the house, I can fill up gaps in the boxes after I put the bigger things like the sandwiches, crackers, yogurt in. What do you do with the leftover scraps of food? When I make cut out sandwiches or decorate with cheese slices, I am left with scraps. I hate to waste it, so I generally feed them to the twins. They don't seem to care at this point that they get the leftovers! They eat lots of PB&J crusts for breakfast. Also, sometimes I'll tuck the smaller scraps, like the pieces left from the cheese shapes, underneath the sandwich where you can't see them if I don't give them to the babies. What do you send them to drink? The girls each have a SIGG water bottle that they bring. I only put water in them, because I figure the one day I fill it with juice or milk they'll leave it and it will get nasty. Aaron used to reuse an old Gatorade bottle, but the other day I finally bought him his own aluminum water bottle as well. 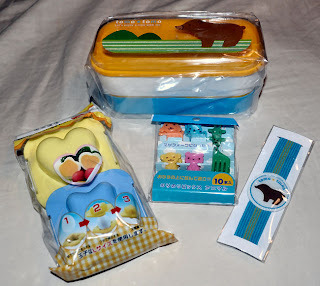 But, I have this bento starter set up for grabs at my main blog, The TaterTwins- so go over there and enter to win! The girls have Strawberry Pocky in the lid. 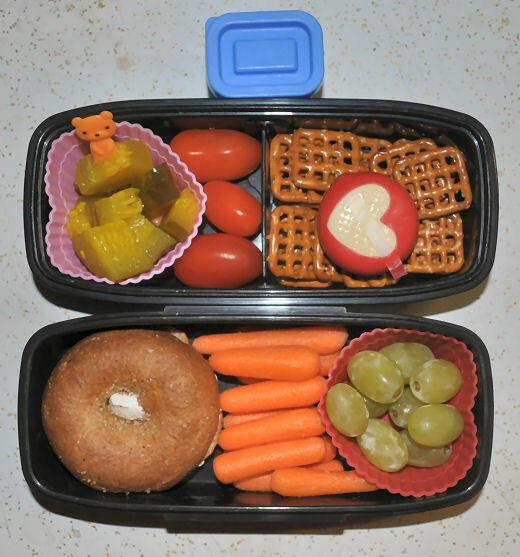 In the top tier, there's mini turkey pepperoni and a BabyBel cheese in the heart, carrots, and a whole wheat bagel with cream cheese. On the bottom, they have vanilla yogurt covered raisins in the mini muffin cup, grapes, raisins, dried apricots, and banana chips. Mia didn't eat any of her pepperoni and Lili said they were a little spicy. Aaron has duty tomorrow, so he won't be just eating lunch at work, but dinner as well. 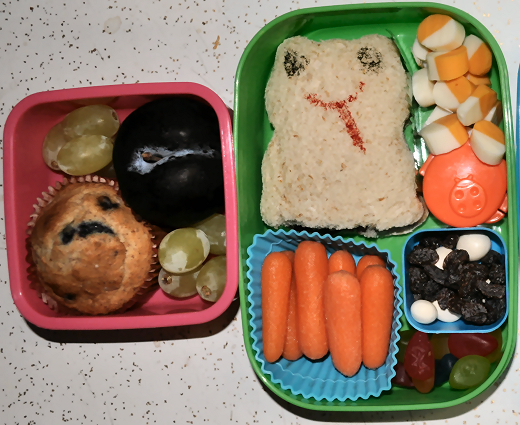 I used our Easy Lunch Boxes and packed him a huge lunch, and a bunch of snacks. I made him a big salad with romaine, tomato, cheese and chili lime tortilla strips. In the blue container (from our Laptop Lunchboxes set) is ranch. There's also potato salad. In the other container, there's two turkey & muenster sandwiches, grapes and carrots. I put both containers in the Easy LunchBoxes insulated bag, and added some pumpkin pie pop-tarts, a fruit & grain bar, peanut butter crackers and a yogurt. Between what I've packed and the various junk he buys at the gedunk (usually burritos, hot pockets, cup of noodles, etc), he should be good to go. For the girls tomorrow, I packed a lot of roll ups, since they think eating off of the food picks is so cool. The girls also have a small salad, with ranch in the dip container. In their main containers, they have tortilla rolls with cream cheese, chives, and shredded carrot as well as bologna & cheese rolls. They also have fruit snacks, grapes, raisins, and yogurt covered raisins. Aaron came back a day early! For lunch tomorrow, he'll have pickles, cherry tomatoes, pretzels, BabyBel cheese, a bagel with onion & chive cream cheese, carrots, and grapes. In the the dip container, there's ranch for his veggies. 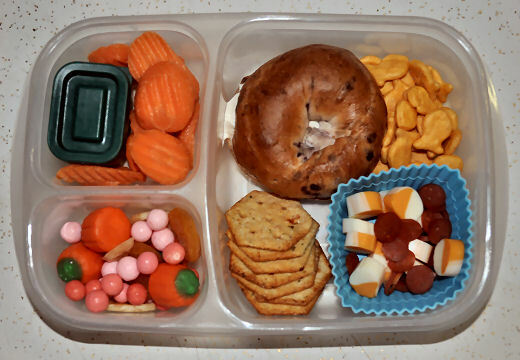 The girls have bagels with onion & chive cream cheese, carrots, grapes, BabyBel cheese, fruit snacks, a cookie, raisins, vanilla yogurt, and strawberry pocky in the lid. For tomorrow, the girls will have bologna & cheese sandwiches, pretzels, a cookie, and raisins in the main box. Mia has carrots, and Lili has pickles. 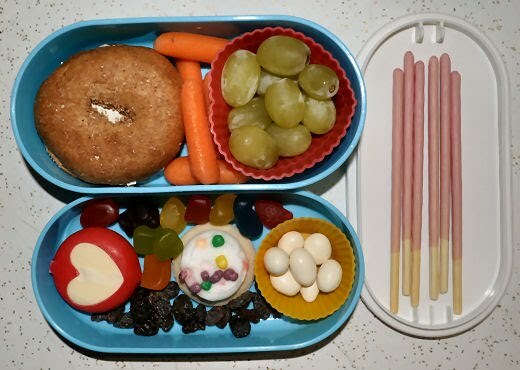 On the side, I packed grapes and peach yogurt with some sprinkles. I'm on a roll lately with lunch packing! Vanilla yogurt covered raisins, grapes, a cherry tomato balloon (LOVE those picks!) and carrot sticks. I used a frog cookie cutter, and attempted to make eyes and tongues on the sandwiches with edible markers. Each girl has grapes, a plum, and a blueberry muffin in the side car. 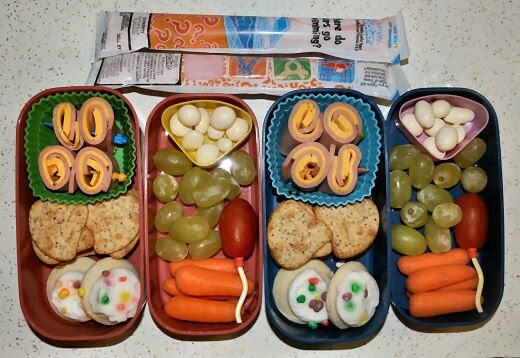 In the main box, there's the frog PB&J, a cheese stick that I cut up, ranch dip for the carrots in the little container, carrots, raisins and yogurt covered raisins, and fruit snacks. The girls have a whole wheat mini bagel with chive & onion cream cheese, bologna and cheese rolls, raisins and yogurt covered raisins, a cookie, fruit snacks and apple slices. I threw a granola bar on top for them to have as their snack. Aaron has turkey, muenster and tomato on a whole wheat sandwich round with muenster stars on top (it looked so boring LOL), pickles and apple slices. On the side, yogurt and potato salad.